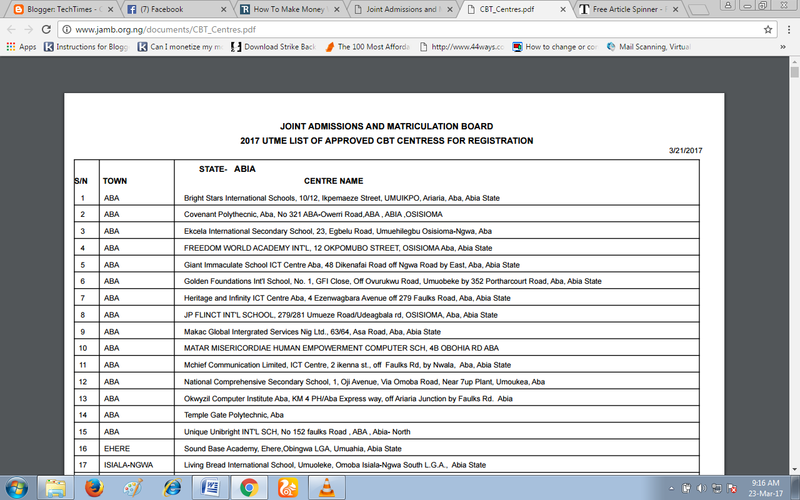 The long awaited JAMB 2017 Unified Tertiary Matriculation Examination (UTME) portal is now open for registration to those students whom have been waiting eagerly. It might interest ou to know that JAMB has introduced some changes in the registration process and has given prospective students instructions on how to register for the examination. I know most people reading this article right now are those who want to take the examination or one way or the other has someone who wants to take the examination. Now you have to be attentive as I am about to show you the instructions/guidelines issued b the examination body. Every prospective student is expected to pay a registration fee of Five thousand Naira only ₦5,000). Candidates for both DIRECT ENTRY (200 LEVEL APPLICANTS) and UTME are to pa this said fee. 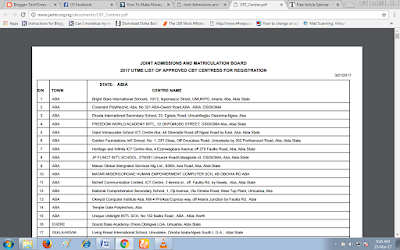 According to JAMB, Candidates are also, as usual, to pay Five Hundred naira (₦500) only to obtain the reading text- ‘In Dependence’ for UTME candidates and ”The Last Days at Forcados High School” for Direct Entry candidates. Though not compulsory but the mock examination which will help students prepare for the examination proper will take place across all accredited computer based test (CBT) centres. This exam will help students sit up awaiting the exams proper, so applicants who are interested are to tick the option of "mock exam" when registering on the portal. Though, students are to pay Seven Hundred Naira (₦700) only into the bank account of the desired CBT centre He/She desires to take the mock examination. JAMB has stated the examination will come up the 8th Day of April, 2017. Every prospective candidate must have an active email address and phone number during the application process. It is pertinent to note that application would not be successful if applicants provide an already used phone or email address. A prospective candidate is to personally go to the JAMB examination portal and create a profile using the JAMB Android mobile application, Windows app, IOs App. A student without a smart phone may as well go to a Bank or NIPOST and build a personal profile on the examination portal providing the following: Name, date of birth, active email address, phone number and Local Government of origin. Next, visit any Bank or NIPOST office to pay for JAMB's E-PIN. These services may also be rendered at the CBT centres and JAMB state offices by the Banks. Next, students should go to an accredited CBT centre (check the JAMB portal for the list of accredited CBT centres) with the proof of payment and personal profile. See screenshot below of how the list looks like. After registration JAMB or the CBT centres provide candidates with the reading text and CD containing; JAMB e-brochure, e-syllabus, application process guide, instructions on how to use the CBT computer without mouse (keys to be used on the keyboard) and a video message from the JAMB registrar. 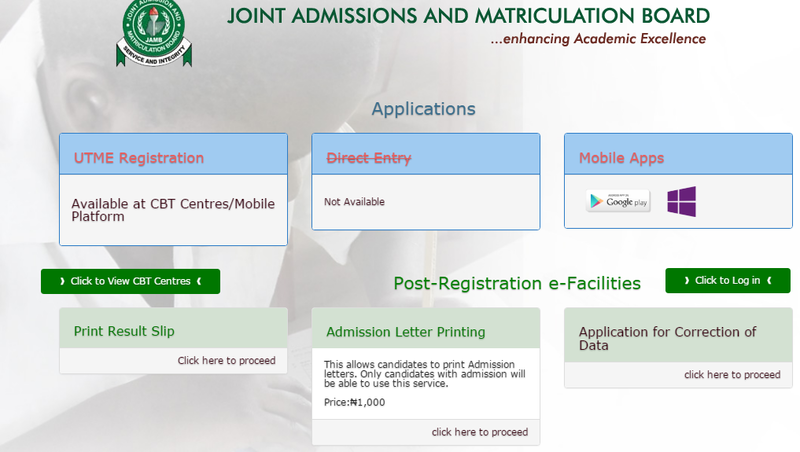 It is worthy to note that JAMB has in some way made the registration process a bit easier for prospective candidates as compared to the previous years.